Score Super Bowl Tickets with PrimeSport and receive 5% off with this promo coupon code. Any football fans? Tis the season, right? Our calendar is filling up with game day invites from friends. What a great way to spend the weekend! Are you looking to head to the real deal? The Super Bowl is right around the corner. 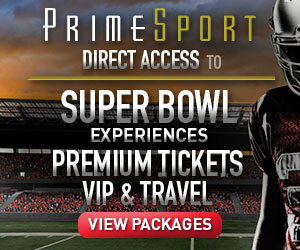 PrimeSport is your one-stop shop for everything Super Bowl – game tickets, VIP hospitality, and Travel. And guess what?! PrimeSport is also offering 5% off with the promo code: Izea. Jot that one down!! This is a Sponsored post written by me on behalf of PrimeSport for SocialSpark. All opinions are 100% mine. Whether you are looking for Super Bowl Tickets, Super Bowl Hospitality, or Super Bowl Travel Packages — PrimeSpot is the site for you. What Exactly Can You Expect From PrimeSport? • Game Tickets: PrimeSport offers multiple locations at competitive prices, so fans can choose where they want to sit to enjoy the game. 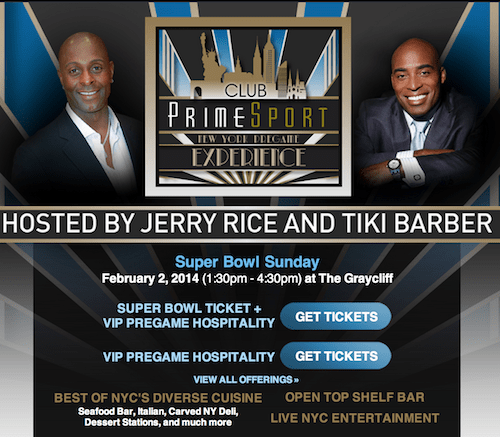 • VIP Pregame Hospitality: Hosted by NFL Hall-of-Famer, Jerry Rice and NY Giants veteran, Tiki Barber, Club PrimeSport features the best of NYC’s diverse cuisine including authentic Italian, carved to order NY deli and dessert presentations and more. • Exclusive Green Room In-Stadium Hospitality: Within The Green Room’s chic, 5,000 square foot space, guests can choose from an array of seating throughout the game; the sleek circular bar surrounded by HD monitors, an outdoor patio with bar tops or lounge seating and lower bowl, sideline seats. • Travel Packages: The site offers several Super Bowl travel package options for fans interested in coming to New York for the game. Available hotel properties include the Hilton Times Square, Ritz-Carlton, Four Seasons and many more. PrimeSport’s packages include hotel accommodations, game tickets, access to PrimeSport’s VIP pregame hospitality party hosted by Jerry Rice and Tiki Barber, roundtrip game day transportation, staff on site to assist, and more. • Super Bowl Parties – 50 Yard Lounge & Jets House – The 50 Yard Lounge is a premier hospitality destination during Super Bowl week from Wednesday through Sunday. This private event is the only place where guests will be able to taste food from the best restaurants and Celebrity Chefs in NYC, meet active and retired football legends and listen to iconic NYC live music, all in a premium environment just steps away from Madison Square Garden, Penn Station and Super Bowl Blvd. Can’t make it to the Super Bowl this year? PrimeSport offers similar Super Bowl packages every year. Be sure to bookmark the site for when your schedule clears up. Bill and I can’t make it to the Super Bowl despite the fact that it is being held in NYC this year. That didn’t stop me from checking out all that PrimeSport had to offer. Those VIP packages sure make the event really special! Imagine being able to watch the game alongside some football legends? WOW! If you are planning on heading out to the Super Bowl this year, be sure to visit PrimeSport for your Super Bowl Tickets. And don’t forget to use the promo code Izea for 5% off!